Olympic Gold medallists Dame Kelly Holmes and Sally Gunnell OBE head off in search of antique bargains in London. Browse content similar to Dame Kelly Holmes and Sally Gunnell OBE. Check below for episodes and series from the same categories and more! We've got two famous cities for you today, Bargain Hunters. I hope you're feeling energetic! Me? I like to keep in shape, but generally only one step at a time. Whoa! That's enough exercise for one day. We're under starter's orders, let's go bargain hunting! and challenge them to buy three antiques with £300. We then go to auction, sell the items and see if our teams can make a profit. today at Alfie's Antiques Market. experts, if they're fit enough to keep up, and don't peak too early. Let's limber up before we meet our first team of famous faces. For the Red team, we have Dame Kelly Holmes. when she won two gold medals for the 800 and 1500 metres. and the country's first double gold winner at the same Games since 1920.
and in 2005, the Queen created her a dame. Today, however, she'll be taking on her toughest challenge yet. I don't doubt she'll be aiming for victory. Welcome to Bargain Hunt, Kelly. -Have you been in training for today's event? I really don't know much about antiques, I have to say. But I'm very competitive, so we'll give it our best shot. You don't need to know much about antiques. No, something that looks good. Looks good and makes load of money. That's what we want. Who've you brought on your team? -I've brought my mother dear, Pam. -Hello Tim. Nice to meet you. So who's going to be the boss today? -There's only one boss in our family. It's me! -Has Kelly always been competitive, Pam? Always known what she wanted to do. She was determined to get it and she has achieved that. the mother watching the race. What does it feel like? Even the build-up I feel like I'm going to have a heart attack. when I'm watching on television. You know anything can go wrong on the track. You get a knock or trip. "Shut up, just watch it!" -You're a Bargain Hunt fan. -What do you like about the programme most? buy which you think doesn't look anything and yet can make money. it's not even worth looking. But she's adamant, so I'll go past all the glass. There's loads of stuff here. You're going to have great fun. Let's see who the Reds are up against. For the Blue team we have Sally Gunnell OBE. World, Commonwealth and European gold medals at the same time. woman in athletics history to hold this prestigious record. 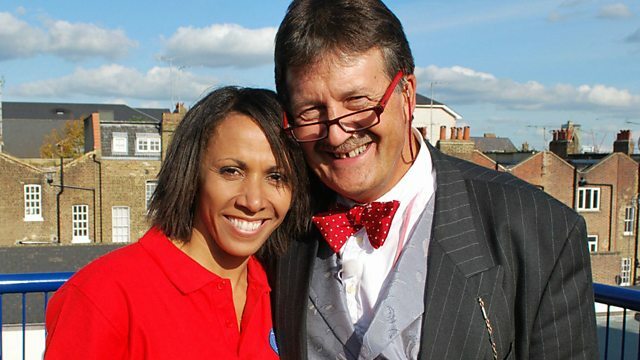 but will she be breaking any Bargain Hunt records today? Welcome to Bargain Hunt, Sally. -Thank you. I'm looking forward to it. -How familiar are you with antiques? Well, I grew up with them in Mum and Dad's house. There was lots around, furniture, pictures. But oblivious to it all. So who have you brought to help on your team? I've brought a very good friend of mine, Emma Rogers. How do you do, Emma? Very nice to meet you too. to get the right price for our pieces, she's the woman. I'm sorry. I think she may be sorely disappointed. Have you got any antiques in your house? I haven't really. I did grow up with them. Like Sally, I was surrounded by antiques. Very understated. they have a Clarice Cliff plate. -None of us knew existed. -So you're planning to nick that one, are you? Sally, have you got a plan as to what you're going to buy today? We are going to pick things we like. I think that's important. I'm looking really, we're big jewellery people. sort of thing would be good. So we're going to stick to that. You're talking the sort of language that's going to scare the Red team. You'll be all right. You are very competitive after all. I think we should have a little handshake. This is all very friendly between our teams. Look at this! Very, very willing. That's lovely. Anyway, here's the money moment, £300 apiece. You know the rules, your experts await. Off you go and very good luck. Wow! A competition between two of Britain's most famous Olympic athletes. But who today is going to win the bargain hunting gold? So, let's meet the experts. Keeping the Reds on track is former PE teacher, Philip Serrell. is supreme athlete, Mark Stacey. They're off, but they must be selective and not just pick up any old rubbish. -Just modelling my frog bag. Are you hopping mad?! Now put it back. I wonder if the Reds are getting into the groove. What's really sad is I can remember, that's Chris Montez, isn't it? -Why do you like that? Because it's something different and it's my era. You can just imagine beach parties and you're dancing there. -I like it, it's quite quirky. -I think it's a great bit of fun. another one in here, clearly not the original wrappers for them. A carrying box for the records, the vinyls. This is clearly battery operated. It plays 45s. A little portable record player by EAR. When these sold new, they were 14 guineas. In 1960! That was probably not far off the average bloke's wages for a week. -So today that would be, I don't know, £300 to £500? Let's get straight to the bone. No competitive interest here, is there?! It's what we're going to make. No pressure, Phil! It's priced at 125 quid. I think if you have a bad day at auction, it's 20 quid. If you have a good day at auction, it might be 80 quid. So, I think a fair price, if we can get it, is around the £50 mark. That way we go to auction, we might make 20 quid, we might lose 20 quid. -Do you like it, really? Shall we walk out to Chris Montez playing? Do the jive then. Well, they danced the record player into their bargain basket for £55. by going straight for the jewellery? -I do. I like it a lot. -It's not very old, is it? -It's lovely. It's quite simple. -What do you like about it, the simplicity? the way it sits in that V, and the roundness and the colour of the stone. I don't know if you're meant to go for things you really like. I think it helps. If you like it, there's a chance somebody else might like it. I'm sure you've got impeccable taste. I don't know about that! How old do you think that is? I can tell you, it's very '60s or '70s. -This is almost certainly going to be Scandinavian in design. These tend to be referred to as torque necklaces. with a little stone in the middle - semi precious agate. And this is cabouchon, it's not cut, it's been polished into a little round shape. I like its simplicity. I think it could appeal to lots of people. -It's very now, isn't it? -The key question, Sally, is how much are they asking for it? I think they want £145. It's not too bad, not over the top, but we need to get the price down. -Are you capable of going in and fluttering your eyelashes at these dealers? -Now's your time. Why not? 'Ooh, those girls really mean business. 'They snapped up the silver necklace for 120. So, the Holmes family on the roof. How lovely! Now, Kelly, what have you bought? I've brought two of my 12 medals, my two golds from Athens. -This one's the 800 metres. Fortunately, we had our names engraved on the back, and the times. People always say, "How much are they worth?" For me, they're priceless. They're beyond price. So this is the 1,500 metres? or I would've pawned them myself or something. They said there was about 16 grams of gold and the rest is a bronze mix. -The kind of core of it. This is a big thrill for me to be able to handle one of these medals. -When you talk about value it's impossible really to accurately assess. they're yours for ever - would be in the order of £40,000 to £50,000. The insurance figure should be £100,000. -I have and they're coming with me! I'm having these melted down and they're coming in my coffin. I've worked too hard for these. So no, those ones are coming all the way. That's very, very special anyway. Pam, what have you brought? in an antique market in Rye, Sussex. This is a fruit plate, isn't it? -You've got these impressed designs of pears and what not. It's an interesting technique in manufacture, because it's blown into a mould. To get this grey, flecky finish, it's been dipped in acid. want to go grey and leave clear the ones you do. the frosting on those details, which is really very pretty. I'd date it probably around about 1950, that sort of period. Which curiously enough is just like something that I made earlier. No. This is a wee piece of glass that I found. I wanted to show it to you. -For me it does it in modern glass. It's an impractical vase on a small base, so it would fall over easily. for the man who's done the engraving. with these odd birds knocking around, which are beautiful. -I guess it would bring £1,000, something like that. It's incredible. And my mother's? You'd probably get £80 to £150. We'd better put that in the auction then. You are naughty, you girls. -Listen up you two. Put the mini ties down. What attracted you to this piece, Emma? It's not overstated. It's quite simple. Some things can be too ornate and too twee but I like the basic pattern. This is quite a clean line. Even though you've got reeding on the edge and stepping on the feet, this is geometric. It's not real silver though, is it? We'll have to have a look, Sally. There should be marks somewhere. Yes, right in the base there, can you see the word "sterling"? -The first thing that tells us is it's actually American. that which look like a hallmark but they're not quite a hallmark. but they couldn't. So they reversed it, the line is on the wrong side. century, maybe 1920s to 1940s. -It'd be lovely with apples in or oranges. -Maybe have it on a hall table, the middle of a table. You could put your business cards in there. I quite like that, I would put it on my dining room table. What I don't like is the £180 price tag. -That's a lot of money. -It is a lot of money. It's a nice piece but not a lot of weight. Having said that, it is silver. -but £180 is a little bit on the high side. 'That Emma claimed not to be good at haggling. -What do you think about this? -Normally these things have a handle that long and that bit makes it about that long. I think this is probably for blokes of a slightly rotund nature. and it's a button hook and you did the buttons on your shoes with it. Right! Or undone your laces. -It is silver, is it? in Edinburgh in 1810 and the makers were Muirhead and Arthur. -Has it got a hallmark on it? can't read, so I'm going to have to trust the label. -Can you see it there? Is it a collector's item? These were very collectable ten years ago. The market for this sort of trinkety stuff has fallen off a bit. -It's up for £25 but I'm sure I can get a bargain. -I think it's cheap enough for that. -It's got to make £20 in an auction and with a bit of luck, it might make 40 quid. Let's see if I can get it for 20 or something. You go that way and we'll go that way and we'll meet in the middle. 'Kelly knocked a fiver off, securing the button hook for £20. What have you brought to show me? or not really but I guess it's the sentimental value more than anything. -So it's your prize for producing three children? That's rather interesting, isn't it? This style loosely is art deco, so '20s or '30s I would guess. which are inset with tiny diamonds. which sort of set the big stone up and it looks really nice actually. A gemmologist would look at that stone and try to assess the clarity. Exactly how clear these diamonds are does affect its value. I think I'd better give it back to you before we lose it through a crack on the table. sporting related stuff as a collectable? -I've never seen any really. -They've got one or two bits here at Alfie's. so it's not precious in any way, not silver or anything. But it does represent the late '30s novelty. -Tennis was big then as well. Something like that at Alfie's would cost you £150. And footy is endlessly popular. -With this, I can imagine. It's been mounted on an oak plaque. And I suppose originally it would've held cigarettes or something. But quite fun. It's yours for under £100. -When would that have been made? Tell me, are you having a great day? I've had a fab day. Very confused. -I've got very expensive tastes. 'Keeping an eye on the budget is important with only £300 to spend. 'So far the teams have bought two items each with one more to find. Stop looking at the bling. in the early part of the 20th century. Original silk lining. A bit tatty. A photograph frame. Who's going to buy that? This is an opportunity for a bit of added value. I know you've been modest about what you've done. -I could sign it for the person who buys it. -Yeah. I don't want to embarrass you. -Can we can get away with it? Yeah. You've got be creative in these things. you personalise it and sign it, we get that in the catalogue. It's important they catalogue it and it's got to make £30 to £50. -Are you up for that? -Let's do it. Don't tell the others though! when it comes to searching for those profit-boosting bonus buys. 'They'll use any cash the team hasn't spent to find a surprise item. 'This will be revealed at the auction, where the teams decide to take it or leave it. you don't come up with the goods. at home today, so look what I found you both. We won't be able to afford that. Well, let me tell you about it. very Clarice Cliff. It's part of the lotus range of vases. Sometimes these have one handle here, or two handles there. Some nice summer flowers there and lily pads. Underneath we've got a Clarice Cliff mark. they used in the height of the period from 1929-36. Just a little bit after that, 1938 maybe. Surely it's going to be too expensive for us? We haven't got that much left. dealer and believe this or not, she's offered it to us for £100. No! What have you got do? It could mean the difference between winning and losing. That's the catch. Shall I go and get it? 'This is turning into a fierce competition. That's it, the shopping's over. let's check out on what Kelly and herself mother have bought. The Reds rocked off with the '60s record player. I love that. A vintage record player. It's not vintage. They're only 45s, I'm not vintage. on the 19th century silver button hook, for which they paid just £20. And finally, could it be a photo finish with the £15 picture frame? We've done something a bit naughty really. T-shirt and I'm going to personally sign it for the person who pays most. but we ain't told Sally though! Philip, how was it with these guys? They were quick out of the box but I think I was probably in bronze medal position here. Which piece is going to bring the biggest profit then? -Did you say "Picture of me"?! I'm not allowed to tell you that. There's a little bit of strategy. -You only spent a pathetic £90. -We thought that was good tactics. I gave you £300 and you only spent £90. We're trying to go for the biggest profit. Is that what it is? Well, it made £210 of leftover lolly. That goes to P Serrell. What are you going to spend it on, without giving anything away? Well, I dunno, I'm going to have to reflect on it. All right, then. With that very heavy hint, off you shove, Serrell. Let's recap on what Sally and Emma bought. and I would've been very happy shopping. and you spent almost half of that on the silver torque necklace. but is it right ripe for a profit? Finally, Emma felt at home with the vase. The Clarice Cliff that my granny has is more ornate. This one is much simpler. Simple design and an uncomplicated price. -A nice round £100 is what they paid. I went from being very confused to getting some great bargains there. So, Mark, are you absolutely exhausted? I've gone through the hurdles today, Tim, but we've had a wonderful time. They're great fun and I think the dealers are worn out with us. I bet they are. Which is going to bring the biggest profit? And you did spend a magnificent £295. I'm so pleased with you. That's fantastic. I don't think he is over there. £5 of leftover lolly, please. Poor Mark, what are you going t to spend that on? A cup of tea and a sandwich? No, I've got something I think that might just plant us a profit, Tim. Good luck as you go and find that bonus buy. -She'll sign it for you. at Criterion Auctions in Wandsworth. Dame Kelly and her mother went with this tribe. Philip Serrell found the record player. What do you think? Very typical of the 1960s, working order. Nice to have the record player with the case. -Is it going to sell, though? -We've got £20 to £40 on it. -That might be difficult, mightn't it? one of the most useless pieces of kit in these times. Do you think you'll be able to sell it all right? off the end and make it a magnifying glass or something like that. That's quite cunning, isn't it? That's a bit of a tip for you. So what's it going bring then? -20 to 30 on that one. so she should show a profit, an Olympic profit. but later endorsed by Dame Kelly. -That's rather a clever idea though, isn't it? which will be signed, that should raise the value. -To what, do you think? happens to the record player. Just in case, perhaps you ought to look at the bonus buy. So, Kelly and Pam, you gave £210 to Philip Serrell, you entrusted him with all that bonus buy money. -What did you spend it on, Phil? This is a modesty mirror. -you just turn it round. -How old is that, then? -might be as old as me, perhaps not. -So who would use a modesty mirror then? You two would, because you're very modest. No, Kelly would have it that way all the time. It wouldn't be turned round. It's Turkish, it's what we call white metal silver. I paid £80 for it. -it will either make £40 or £100. -So you're predicting maybe if it does well, a £20 profit? let's find out what the auctioneer thinks about Philip Serrell's modesty mirror. What do you think about that, Daniel? A bit of a Turkish delight? For some. It's Turkish, it's stamped 900. It's going to appeal to someone. Someone with flashy taste, I'd say. It's a very showy thing. Fine, it's low-grade silver, but who's going to buy it, Dan? It needs to be in at a cheap price to attract somebody. -So we've got 30 to 50 on it. So it's in the lap of the gods, isn't it? -That's it for the Reds. Sally Gunnell went for this torque. How do you find modern jewellery goes at auction these days? Some of it, especially something like that, Tim, is going to appeal. Nice simple design, isn't it? We've got 30 to 50 on that. Oh, my Lord, she paid £120. That's going to be difficult, isn't it? a nice American cookie dish. -Do you like that, Dan? -It's a neat thing, Tim, yes. American silver traditionally isn't the greatest of sellers at auction. -As opposed to English but it will sell. -Oh, dear, £75 paid, so there is a bit of a dark hole there. I'm going to ask you about the Clarice Cliff vase. It's a good lotus form shape. -but it is of the period, 1930s. -So what's the estimate, Dan? There is some hope, £100 paid. They should get a good wodge of profit out of that. Potentially there are a couple of other losses there. Let's look at their bonus buy. So you naughty girls, you spent £295, which is marvellous. Giving poor Mark only £5 to find his bonus buy with. So Mark, show us your wares. including Her Royal Highness Prince Michael of Kent and a lot of city dignitaries. Each was given one of these, it was a fiver. I think we'll dig up a profit. I thought for a fiver you can't go wrong. It's quite solid, isn't it? Any predictions as to what it might bring? I think it will at least double it. -I was hoping for £20 or £30 at least. a £5 buy. Anyway, you don't have to decide now. You decide after the sale of your first three items. But for the viewers at home, let's see what the auctioneer thinks. -It's my first one, too. How are you on valuing spades, then? and we've come up with £10 to £20. £5, Mark paid, so he'll be well-pleased with that. So are you going to be digging for victory for us today? I'm selling tonight for you, Tim, and I'll certainly do my best. 70, 5 at the back. 80, sir? No. 75. 75. -how nervy are we feeling? -Do you feel as if you're on the blocks? I certainly feel like I'm on the start line. It's a terrible feeling, You just don't know what's going to happen. None of us know what's going to happen. old kind of money, which is what's such fun about it, Phil, isn't it? Your reputation's on the line, Phil. She might be in the blocks. My neck's in it! You'll get nothing chopped off! I've got a good feeling about this lot. First up is the record player. matching case and records thrown it. There you go. It works. 10, I have. At £10. Money's here with me at 10, 15, 20. 5. 25. At £25, are we all done? I'm so sorry about that, £25. Just shows what I know. Minus £30. Don't despair. Here's you're button hook. A 19th century silver handled long button hook. 25? 20? 10 is bid. 12, 15, 18. At £20, are we all done? £20, no profit, no loss, no shame. We're all on your shoulders, my love. it comes with a photograph of Dame Kelly Holmes. At £50. Are we all done? £50 then. You've made plus £35, which overall you're plus £5. So what about that? You made a fiver. That's an achievement. What about this bonus buy? Are you going to quit with £5? -Or are you going to risk £80 for the modesty mirror? -Are you going to risk it? Pam, what do you want to do? I don't think we're going to. but we're going to sell it anyway! Lot 126 is a Turkish white metal or Continental silver modesty mirror. -£30? £20 if you like. 50. 2 if it helps, sir? You've made a £5 profit. More to the point, you've retained your profit, which is brilliant. OK, SG and Ems, how are you feeling on the excitement stakes? I'm very excited, which I'm quite surprised about. I feel nervous. A little bit of tension. I wasn't but all of a sudden. It's great, isn't it? It's called adrenaline. -But you'd know all about that. My heart's pounding a little bit. Does it go like that when you're on the edge? I just hope there's somebody in here wanting one of our things. Wanting three of your things. First up is that lovely silver torque. SG, this is your moment. 156 is a 20th century silver torque. At £30 somewhere? £20 if you like. 20's bid. 5, 30, 5, 40. At £50 now. At £50 are we all done? You sold it for £50. You are minus £70. Don't despair, sweet pea. Lot 157 is an American sterling silver pedestal fruit dish. Good thing. And £30 I have. At £30. 35, 40, 45, 50, 55, 60, 65. Yes! That's brilliant. £80, you've made a £5 profit on that. Now the Clarice Cliff. This is serious. A good Clarice Cliff lotus form vase, good shape. £100 for it. 160 in the nick of time, sir. £160. £160. You made £60 profit on that. That's so brilliant. You have £65 and you're minus £5. -Are you going to go with the spade? -We can't go with the spade. -Come on, isn't this exciting? I know you want to win. This is your chance. We're going with that spade. All over in the corner now, £5. A splendid item for a fiver. At £5, cheaper than the DIY shops at £5. 8, don't stop, sir. 10. At £10, are we all sure? £12. Thank you very much. At £24, are we all done? If you have spades, bring them in next week! -Fantastic! You've made a profit of £19. You've made a profit of £14. Brilliant. Is that good? We don't know! Just to make a profit on this programme is brilliant. Today we have two teams of winners, both teams have made profits. But have you been talking to one another? -Do you know the extent of these winnings? It's wonderful that you kept mum. We don't have losers on Bargain Hunt, we only have runners-up. I'm so sorry about this. You did so beautifully. You have a £5 profit. I'm going to give you, Dame Kelly, your £5 profit. -which is a dog charity. -It will pay for a bag of food! Every £5 can make a difference. your £5 worth of winnings. Have you had a good time? -The victors today, the Blues. With your profit of £14. -I know you want one more! What are you going to do with your 14 smackers? It's going to go to the Point Foundation, an orphanage in Rwanda. So that will go a long way. some medals for our teams today. which I would like to present to the runners-up. -But for the victors today, as you would expect, gold medals! Do you see how quickly Sally was able to put that medal on? Emma needed just a bit of practise there. We have medallists throughout today's programme. It's been a fantastic show. -Join us soon for some more bargain hunting, yes? visit the website at bbc.co.uk/lifestyle. Olympic gold medallists Dame Kelly Holmes and Sally Gunnell OBE know a thing or two about competition, and there's no stopping them when they head off in search of antique bargains. Dame Kelly's running mate is her mum Pam, while Sally brings along her best mate Emma for support. The teams scour an antique centre in London and find a number of items which they hope will break all records at auction. Dame Kelly takes time out to show presenter Tim Wonnacott her gold medal and to discuss the merits of antique glass, while Sally asks Tim to tell her about a special three-part diamond ring bought for her by her husband following the birth of their third child.